Victorian industrial textile manufacturer C.E. Bartlett has been awarded an $80,000 grant to purchase and install a new state-of-the-art FIAB High Frequency Welder. The funding, which is part of the Labor Government’s Future Industries Manufacturing Program, will further automate the company’s manufacturing process, allowing it to increase production capacity and improve its product range. Minister for Industry and Employment Wade Noonan, who announced the grant while touring C.E. Bartlett’s facilities on Wednesday, said the funding boost will make the company more competitive locally and abroad. “The Andrews Labor Government is helping manufacturers invest in new technologies and processes that will transition Victoria towards an advanced manufacturing economy,” the Minister said. The Labor Government’s Future Industries Manufacturing Program is one of three industry programs under the Future Industries Fund designed tp support high growth industries and create jobs. Companies can apply for grants of up to $500,000 under the Manufacturing Program to invest in new manufacturing technologies and processes that will create jobs and increase productivity. C.E. 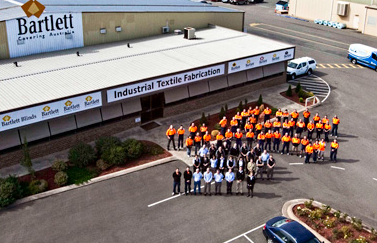 Bartlett Pty Ltd is a family owned and operated Industrial Textile Fabricator which was established in 1956. The company specialises in the manufacture of a wide range of products using canvas, PVC and other synthetic fabrics.